ALCHEVSK, Ukraine -- Scarred by decades of political corruption and many months of war, the rebel-held town of Alchevsk in eastern Ukraine has few attractions. 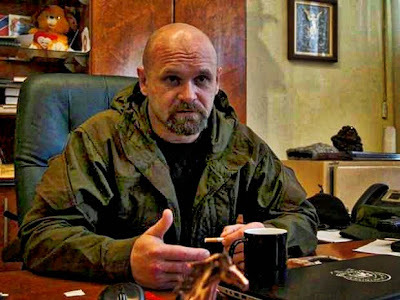 Separatist commander Aleksey Mozgovoi has a fearsome reputation and a bounty on his head in the rebel badlands of the Luhansk People’s Republic. He tells Oliver Carroll in Alchevsk that hopes for a lasting Ukraine ceasefire are minimal. Its biggest draw is undoubtedly Commander Aleksey Mozgovoi, the enigmatic leader of the rebel “Ghost” battalion, who has taken up residence in the former security services building on Lenin Street. An apparent Renaissance man with a reputation for poetry, and ferocity, Mozgovoi is no stranger to controversy. He organised the infamous “people’s courts”, which claimed to have issued death sentences to alleged rapists in October last year. With a son in tow, Andrei, a Gazprom worker from Russia’s Krasnodar region, waits patiently for an audience with Mozgovoi, whose office windows are protected by sandbags. Andrei fought as a rebel volunteer throughout the winter. He says that he – like many others – was attracted to Mozgovoi’s battalion by a desire to correct a historical injustice, and to protect “the Slavic people” from being routinely humiliated. Andrei is not the only Russian in the region. Two Russian officers are said to have been captured by Ukrainian forces in the town of Schastya, about 25 miles to the north-east of Alchevsk. A video of the interrogation of one of the men, identified as Aleksandr Aleksandrov, was released by Ukrainian security services on Monday. The man is seen to admit to being a sergeant from a special forces unit in Tolyatti, southern Russia. He says he was operating as part of a 14-man group, that there were six to eight such groups operating out of Luhansk, in eastern Ukraine, rotating every four or five days. A member of the Ukrainian Aidar volunteer battalion, who had witnessed the capture of the soldiers, told The Independent that a battle had broken out at the edge of Schastya. The clash left one Ukrainian paratrooper dead, and the two enemy reconnaissance officers seriously injured. They were caught behind Ukrainian lines. “One had a cracked hip, so he had no choice but to start speaking,” the officer said. Local rebel forces have denied that the two men were Russian soldiers, publishing documents apparently showing that the men were locals and members of the “Luhansk People’s Militia”. Dmitry Peskov, a spokesman for President Vladimir Putin, has also dismissed the reports as being “no matter” for the Russian government. But Ukrainians claim that Russians fighting in eastern Ukraine are assigned rebel aliases, and have previously produced dual documents found on Russian soldiers. They are the “green men” that mysteriously appeared before the annexing of Crimea last year. The detention of suspected Russian soldiers in Ukraine again raises questions as to the durability of a ceasefire that has been largely holding across much of the region – to the relief of many civilians and business owners. The Trilateral Contact Group, set up to facilitate dialogue between the parties to the conflict, has reported an increase in ceasefire violations across the region – up to 80 from approximately 40 earlier in the month. Nearly half have been recorded in the seaside village of Shirokine, near Mariupol, though areas around Donetsk airport and Horlivka show signs of becoming similar hotspots. Rebel leaders have offered mixed messages over the last few weeks about the ceasefires agreed in Minsk. Mozgovoi likens the Minsk process to unsuccessful secret negotiations between Kiev and Luhansk separatists last April, which saw Yulia Tymoshenko brokering a deal with the then leader of the Luhansk movement, Valery Bolotov. Mozgovoi was cut out of those negotiations. “We weren’t negotiating with the right people then, and we’re not negotiating with the right people now,” he says. Known for his uncompromising toughness, Mozgovoi is keen to present himself as the conscience of the separatist movement in the region. He identifies himself in total opposition to the interests of fellow separatist leaders in Luhansk and claims that “conscience” is what drives him. “If we are to live by our conscience, everything will work out for us,” he says. He takes a long pause, before continuing. Mozgovoi’s independent approach has not been received well by everyone. Some, indeed, question whether he will be able to survive for long in the wild frontier lands of the “Luhansk People’s Republic”. Over the past six months, several of the most unwieldy rebel leaders have been removed – and many assume Mozgovoi is next on the list. It is well known that Mozgovoi is on difficult terms with the Kremlin-annointed leader of the Luhansk republic, Igor Plotnitsky.